With spring arriving soon, it’s time to gear up for a good spring cleaning. On the to do list is clearing out some clutter from our home. Proud to say we’ve been cleaning and organizing the house bit by bit over the last week months with the cold weather. Now it’ll be time to get rid of our stuff; some of it we’ll be donating, but some of our items are in great condition and we’ll be putting them up for sale. Need Help Selling Your Stuff? If you’re not an expert on selling your stuff or if you’re looking to maximize the money you make, you might want to try grabbing Baker’s wonderful guide, Sell Your Crap. There are actually two packages for the guide, each one tailored to a specific need. If you just need to get started with selling some of your stuff, then the barebones set can fill that need. Baker did a great job getting you what you need to sell your stuff on Ebay quickly. 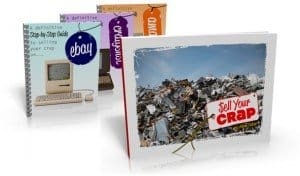 If you’re determined to make some solid money and get rid of junk in your house, check out the clutter crusher edition. I think guide is for those who have a massive amount of stuff to sell and want a complete system. 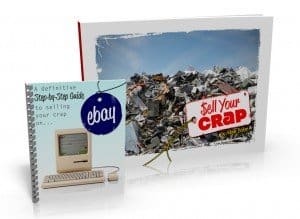 If you’re looking to do it yourself, I just posted some tips on how to sell your clutter on eBay.Do you have junk in the house that you could sell? If you’ve sold clutter and have simplified your life, what tips can you share?